When we talk about climate change, it’s easy to get lost in data points and science jargon and forget the human side of the story. But when the world gets warmer, real people’s lives are impacted. 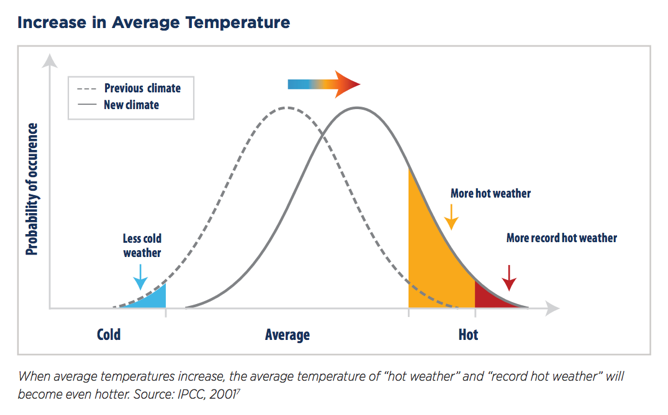 Here’s how climate change, heatwaves, and health are all intertwined. This is a part of a new series from Climate Reality on the many ways that climate change is impacting human health. This is the first blog in the series, but check back for content on topics like hurricanes, wildfires, asthma, and more. What Exactly Is a Heatwave? Generally speaking, “extreme heat conditions are defined as weather that is much hotter than average for a particular time and place—and sometimes more humid, too.” Temperature isn’t the only part of the equation: to qualify as a heatwave, extreme heat usually needs to last at least two or three consecutive days. The humidity component is also important here. 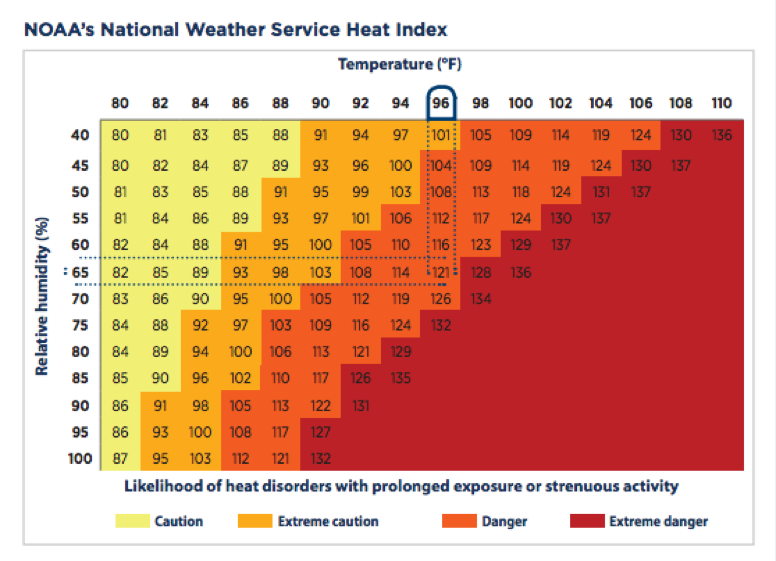 Take a look at the heat index graph below. For example, it may be 96°F (36°C) outside but if the relative humidity is 65 percent, it feels like 121°F to the human body -- while in the shade. Exposure to full sunshine can increase heat index values by up to 15°F! And that’s dangerous. Very dangerous. Extreme heat is more deadly than any other weather-related hazard — on average causing more deaths annually than tornadoes, floods, or hurricanes in the United States. The danger isn’t limited to the US either – during India and Pakistan’s 2015 heatwave, it’s estimated that more than 3,600 people died. How Do Heatwaves Impact Our Health? Plain and simple, exposure to a heatwave can overwhelm the human body. Our bodies are designed to keep our temperatures at about 98.6°F, but exposure to a heatwave makes it very difficult to maintain a healthy temperature. That’s because one of the best mechanisms the body has to keep itself cool is sweating. But if it’s both very hot and humid, sweat isn’t able to evaporate on our skin and we can’t cool down. Heat exhaustion: “A severe illness requiring emergency medical treatment. It can occur from exposure to extreme heat over an extended period of time (usually several days), especially when combined with dehydration.” Symptoms include heavy sweating, weakness, nausea or vomiting, and fainting. It’s important to remember that, like most climate impacts, heatwaves don’t affect all people the same way. Young children, the elderly, the poor, and people with preexisting conditions (like respiratory disease or diabetes) are the most at risk when exposed to extreme heat. So, Exactly How Are Heatwaves Related to Climate Change? Of all the types of extreme weather, heatwaves may be the most obvious one to connect to climate change and, well, a warming world. As humans burn more and more fossil fuels, we’re releasing heat-trapping gases like carbon dioxide into our atmosphere. As a result, we’re seeing more and more warmer-than-average years and more frequent extreme heat events. And if we don’t stop burning fossil fuels, we’ll keep setting heat records and keep experiencing more heatwaves. Yes, extreme heat and heatwaves have happened since the beginning of time. But across the board, climate change is making heatwaves more common, more severe, and more long-lasting. Luckily, solutions to the climate crisis (and its health impacts) are available today. Clean, reliable energy like solar, wind, and geothermal don’t release heat-trapping greenhouse gases like oil, coal, and natural gas. That’s why we have to make the shift. Renewable energy, at the end of the day, just makes sense for the health of our families. It’s a fact: Fossil fuels are driving a climate crisis and threatening the health of our families and communities. Extreme weather is on the rise. Infectious diseases are spreading. Our food and water are increasingly at risk. And yet, far too few people are talking about it. On December 3-4, join us for 24 Hours of Reality: Protect Our Planet, Protect Ourselves. During the broadcast, we’ll travel across the Earth for 24 hours to witness how fossil fuels and climate change are creating an ever-more dangerous world for all of us. We'll also discover, together, what we can do to fight back.